Córas diagnóisice ar líne is ea DIALANG a cruthaíodh chun inniúlacht teanga i 14 teanga Eorpach a mheas. Déantar léitheoireacht, scríbhneoireacht, éisteacht, gramadach agus foclóir a thástáil, ní dhéantar tástáil ar labhairt mar gheall ar shrianta teicniúla. Cruthaíodh DIALANG le go mbeadh saoránaigh na hEorpa in ann a scileanna teanga a mheas de réir Chomhchreat Tagartha na hEorpa um Theangacha – CEFR – mar bhunús d’inniúlacht teanga a mheas. Aithnítear an creat CEFR go forleathan chun cur síos a dhéanamh ar inniúlacht foghlaimeora i dteanga ar leith agus inniúlacht a thomhas. Ní scrúdú é DIALANG agus ní bhronntar teastas as tástáil a dhéanamh ach is féidir le foghlaimeoirí an córas a úsaid chun féinmheasúnú a dhéanamh ar a scileanna teanga, chun laigí a aithint le gur féidir le foghlaimeoirí díriú orthu. Is féidir le teagascóirí agus foghlaimeoirí DIALANG a úsáid chun eolas a chur ar an CEFR. Is uirlis an-úsáideach é DIALANG d’fhoghlaimeoirí teanga chun féinmheasúnú a dhéanamh ar scileanna teanga. Is féidir le teagascóirí tacaíocht a thabhairt don mheasúnú seo trína chuimsiú leis an obair chúrsa. Chomh maith leis sin, faigheann foghlaimeoirí taithí ar mheasúnú ar líne ar scileanna teanga, uirlis a úsáidtear go mion minic anois d’iarratais ar scoláireachtaí idirnáisiúnta agus ar chláir mhalartaithe. Cliceáil ar an lógó DIALANG, nó ar an gcnaipe seinnte, chun scrúdú a sheasamh. Roghnaigh treoracha i do theanga dhúchais ar an gcéad roghchlár. Cliceáil ar na saigheada beaga bána sa chúinne ag taobh na láimhe clé den fráma ar an scáileán chun dul ar aghaidh nó chun dul siar. Roghnaigh tástáil a dhíríonn ar cheann de na scileanna seo a leanas: éisteacht, scríbhneoireacht, léitheoireacht, struchtúir nó foclóir ón tábla. 5. Lean na treoracha ar an scáileán agus freagair na ceisteanna. Maireann seisiún tástála DIALANG 30-45 nóiméad de ghnáth, ach ní gá an triail socrúcháin ná na tascanna féinmheasúnaithe a dhéanamh (ní mhaireann na trialacha teanga ach 20-30 nóiméad). Nóta: níl aon srian ama leis na tascanna, is féidir leat dá mhéad ama is mian leat a chaitheamh orthu. 6. Tar éis an scrúdú a dhéanamh, beidh deis agat cineálacha éagsúla aiseolais a fháil. Siocair gurb é an aidhm atá ag DIALANG go ndéanfadh foghlaimeoirí féinmheasúnú ar a gcuid scileanna, níor chóir go n-úsáidfeadh an teagascóir na torthaí mar mheasúnú. D’fhéadfadh na foghlaimeoirí DIALANG a úsaid chun measúnú a dhéanamh ar an dul chun cinn a rinne siad maidir le scil ar leith ar a ndírítear mar chuid den chúrsa, d’fhéadfaí an measúnú a úsáid mar chuid den mheasúnú leanúnach. D’fhéadfadh mic léinn machnamh a dhéanamh ar an úsáid a bhain siad as DIALANG mar chuid dá bhfillteán foghlama (nó in aiste nó i scrúdú). Is féidir creat measúnaithe den chineál céanna a úsáid chun monatóireacht a dhéanamh ar scileanna teanga an fhoghlaimeora roimh an gcúrsa, i rith an chúrsa agus ina dhiaidh. Students may need initial guidance in how to use DIALANG and for which specific aim. The test may be used to advise new students which language course to take, or help them with regard to their choice of courses at their home institution and during their year abroad. 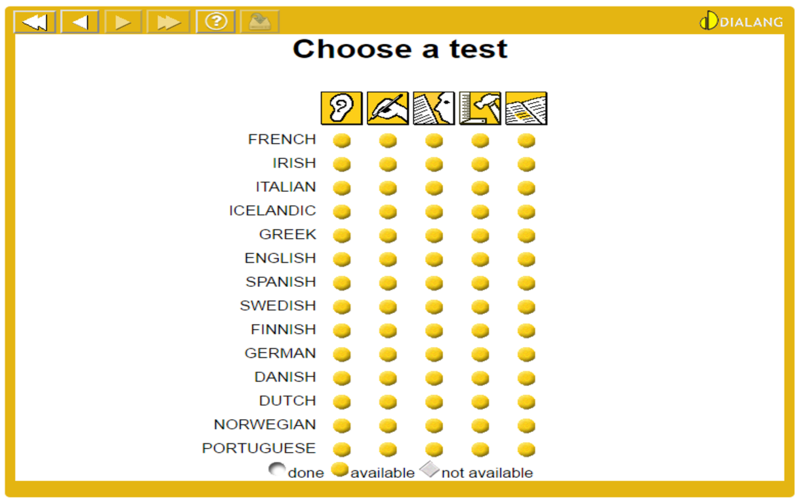 While DIALANG is the only CEFR digital diagnosis tool covering a wide variety of languages, there are other such tools available for individual languages, which are in some aspects more technologically advanced. One example would be the ONDAF test in German, which students have to take when applying for scholarships of the DAAD (German Academic Exchange Service) to avail of full funding of their placement abroad. Learners should be encouraged to use other language-specific self-assessment tools in addition to DIALANG and to compare these, not only in preparation for a placement abroad, but also to developing their digital awareness. Any learner of foreign languages, at any level, can use DIALANG. While there are no age limits for DIALANG test-takers, the test tasks have been written with an adult’s experience of life in mind. The tasks may, for example, include extracts from newspaper articles dealing with issues that may not be interesting or familiar to young learners. Young adults from 16-18 upwards should find the test quite suitable. Learners can freely choose which test to take depending on their needs and interests. Tá leagan Gaeilge Dialang ar fáil ag https://dialangweb.lancaster.ac.uk/setals. D’fhéadfá freisin an Triail Socrúcháin Teanga atá ag Acadamh na hOllscolaíochta Gaeilge a thriáil ag http://www.acadamh.ie/cursai/dianchursai_gaeilge/triail/. Potete leggere le descrizioni delle categorie del CEFR (QCER in italiano = Quadro Comune Europeo di Riferimento per la conoscenza delle lingue) in questa Scheda per l’autovalutazione. Céard is inniúlacht sa hipirtéacs ann? CEFR – Quadro Comune Europeo per le Lingue: Criteri di autovalutazione.